Iris is a genus of 260–300 species of flowering plants with showy flowers. It takes its name from the Greek word for a rainbow. This refers to the wide variety of flower colors found among the many species. 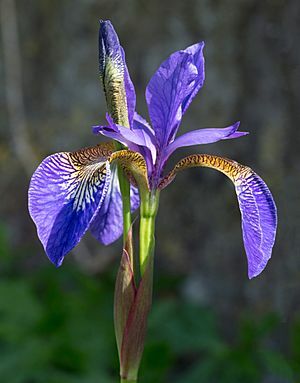 The scientific name, iris is also very widely used as a common name for all Iris species, as well as some belonging to other closely related genera. It is a member of the Iridaceae family It is a popular garden flower. Irises are hardy plants (able to survive outside during winter) that are easy to grow. They attract butterflies and hummingbirds. Irises are a favorite cut flower. The bearded irises (Iris germanica) is the tallest at about 28 inches (71 cm). Irises have three large petals on the outside called "falls". They have three inner petals called "standards". Irises that are called bearded are because of soft hairs growing in the center. Irises that are called combed have a ridge of hairs in the center. A common name for some species is 'flags'. Plants of the subgenus Scorpiris are widely known as 'junos', particularly in horticulture. Iris (plant) Facts for Kids. Kiddle Encyclopedia.